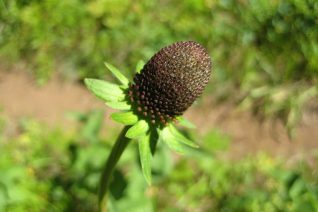 Our native coneflower found in the Cascades. Look! It forgot the petals. Yup thats our boy. Clump forming tall perennial for moist sunny sites. Rich, soil with ample humus. Easy to grow in a perennial border where you can take advantage of the austere look of the flowers, when they come en masse at the end of 30″ stems they are something to behold. Very good cut flower and it goes with a very modern aesthetic. Full sun. Completely deciduous in winter. Oregon Native Plant.